When a group of people reaches a consensus, it has reached a general agreement about a given point. Empathy is the ability to understand how people feel because you can imagine what it is to be like them. If you are incompatible with someone you do not get along or are unable to cooperate with that person and so are in conflict with him. When Sonya was accepted into a program in musical theater, she finally felt a togetherness or rapport with students her own age. Most of the young people in her classes at school did not study theater or music, so Sonya shared a limited social rapport or connection with them. The weeks in the music program, however, were filled with late-night talks and exciting rehearsals which created a rapport, unity, or trustful bond between the participants. Quiz: Try again! 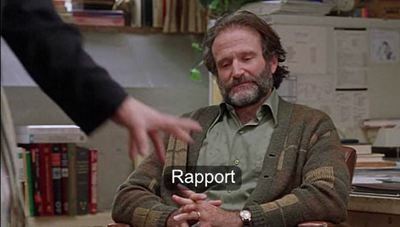 What is a rapport? An honor given to a young scholar. A bond of understanding between people. A performance of creativity and skill. Rapper Support Musical rappers quickly develop supportive relationships or a close rapport that connects them through their musical interest. People who have a great rapport “carry” things “back” to one another in a mutual exchange that creates a close connection over time. Good Will Hunting There is no problem having a rapport with the boy.